1. 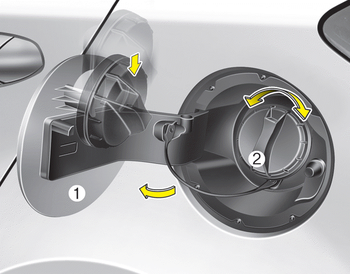 To open the lid, press the center edge of the lid when all doors are unlocked. The lid will open and close only when all doors are unlocked. 2. Fully open the lid (1). 3. To open the cap, turn it counterclockwise (2). 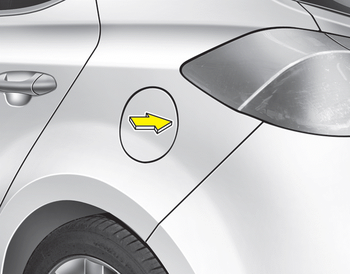 If the fuel-filler lid does not open because ice has formed around it, tap lightly or push on the lid to break the ice and release the lid. Do not pry on the lid. If necessary, spray around the lid with an approved de-icer fluid (do not use radiator anti-freeze) or move the vehicle to a warm place and allow the ice to melt.